Every year I always want to do a “Christmas in July” party or decorate a Christmas in July tree but I never do … until this year! When my friends at Treetopia invited me to be part of a Christmas in July Summer Christmas Tree challenge, I said, “heck yeah!”. 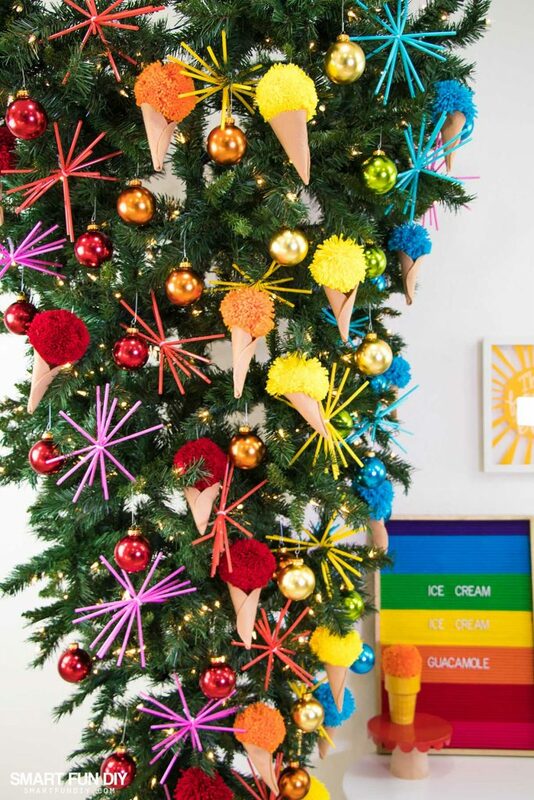 Since it's National Ice Cream Month, the tree also had to have an “ice cream” theme. Who doesn't love ice cream in summer? Yes, please! 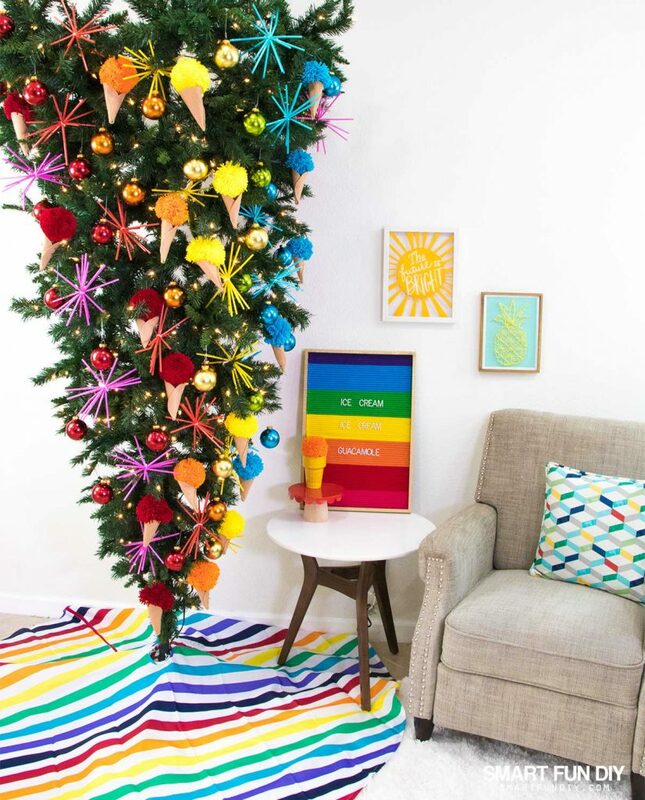 Then they sent me rainbow colored ornaments and an upside down Christmas tree. Say what?! 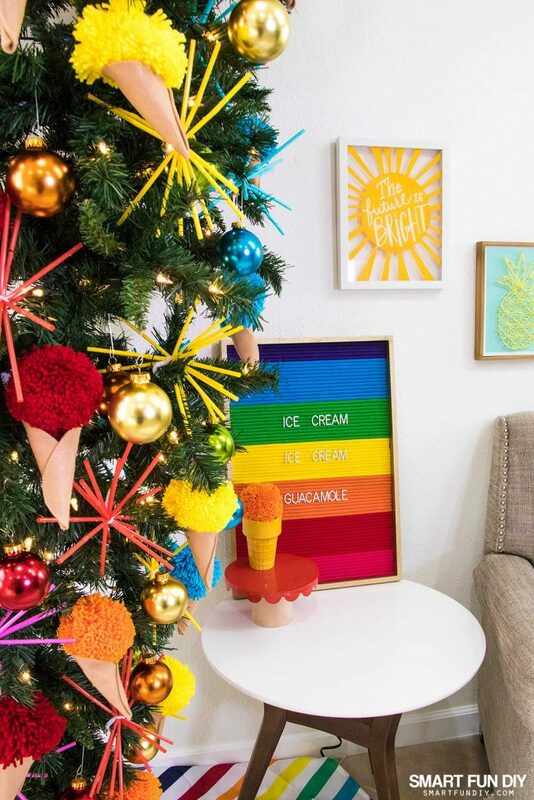 We took the challenge head on, making DIY ice cream cone ornaments, fun straw starbursts, and setting up a whole Christmas in July corner in the living room! Before you read any further, I want to let you know that we are giving away TWO $100 gift cards to spend at Treetopia!!! Make sure you read all the way through to the end of this blog post so you know exactly where you need to go to enter the giveaway. I'd love it if YOU won!! Originally I wanted to use a colorful upside down Christmas tree, like a gold one, to make the whole thing into an ice cream. 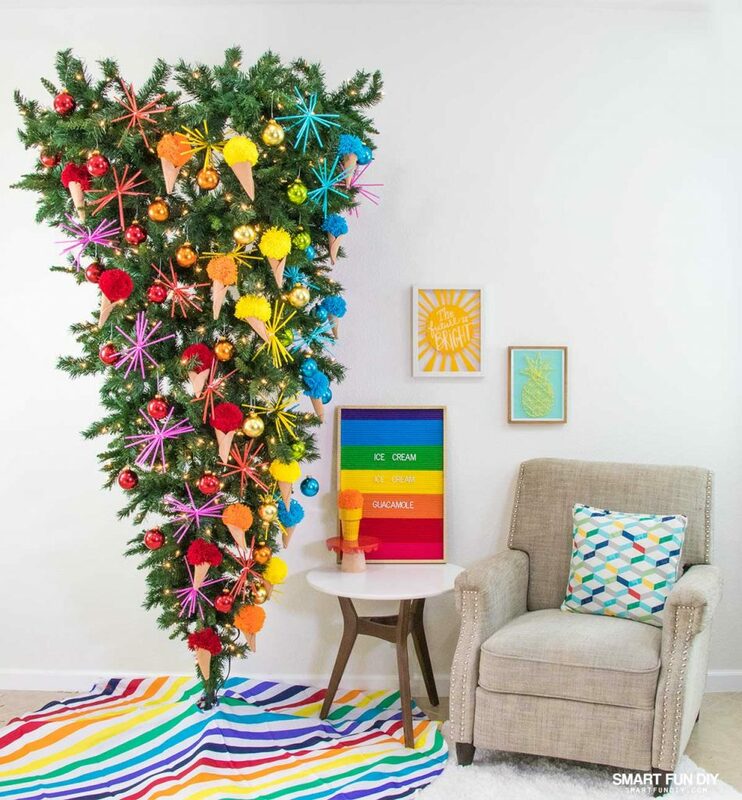 Treetopia has LOTS of colorful trees to choose from on their site: Treetopia Colorful Christmas Trees. I snagged a roll of white floral mesh from the craft store to make the whipped cream and a big red playground ball from the grocery store for the cherry on top. We also ordered a set of rainbow glass ornaments. These are gorgeous and the colors are super rich so we decided to carry the theme by adding more handmade ornaments in the same colors. We used drinking straws from Ikea with chenille stems to make starburst ornaments, inspired by these drinking straw ornaments created by Aunt Peaches. Then we created yarn pom-poms to make ice cream cones. We cut tan felt into 6″ circles and rolled them into cones, securing the ends with hot glue. 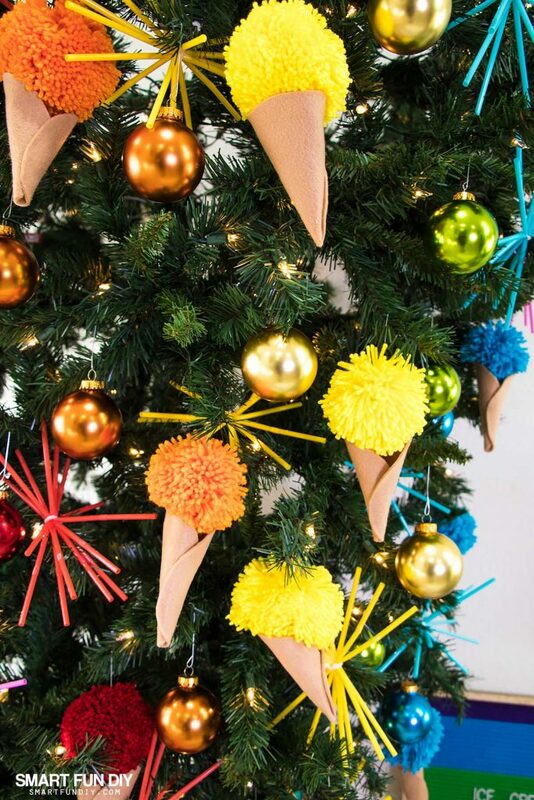 Then we put ornaments hooks in the pom poms and hot glued them to the top of each cone. Easy peasy! This post contains affiliate links which means if you buy from the links, we get a kick back at NO extra cost to you! This keeps the lattes flowing so we can keep bringing you creativity for free. I mean, who doesn't love that?! tan felt – I used Kunin Eco-Fi Premium Plus felt because it is thicker than regular felt. Plus its made from recycled plastic bottles! Watch this video (above) to see how we created the ornaments and decorated the tree itself. 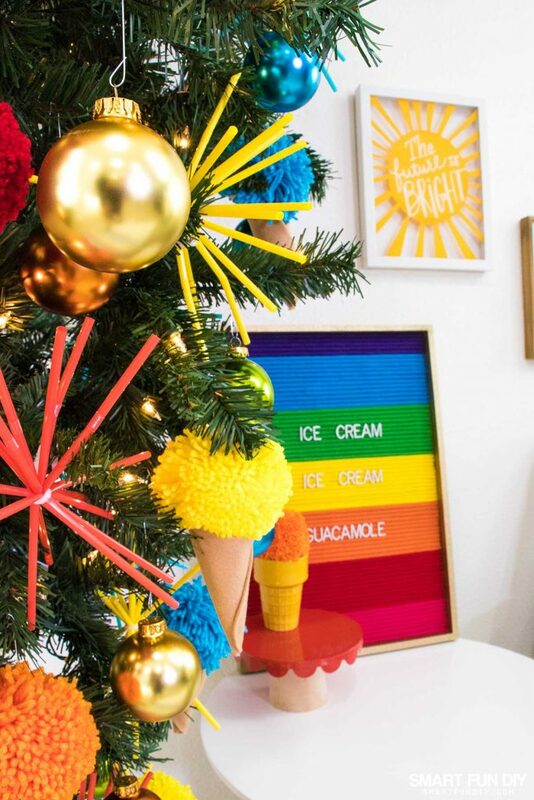 We added a DIY rainbow felt letter board to a small side table and put an extra pom-pom into an ice cream cone shaped dessert cup as an accent on the table. 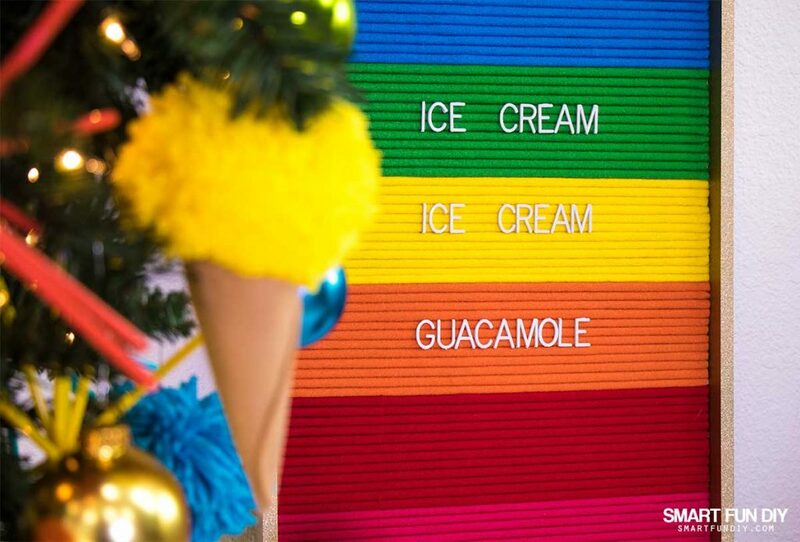 My son Matthew has been singing this silly “Ice Cream Guacamole” song all summer so when I was thinking about an ice cream quote to put on the letter board, that was all I could think of! 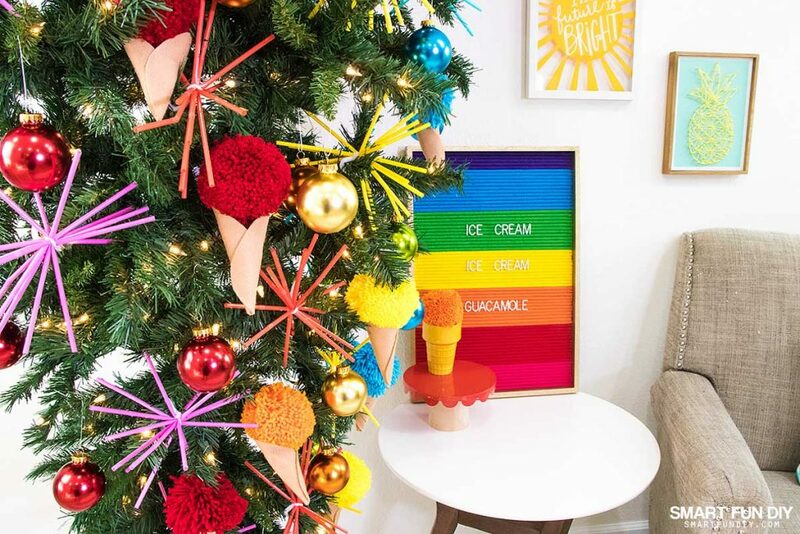 Since summer is in full swing everywhere, it's easy to find summer accessories to make this ice cream themed Christmas Tree come together. I've made DIY tree skirts in the past but when I saw this rainbow patio table cloth (on clearance! ), I knew it would be a perfect tree skirt. The hole in the middle for the umbrella was a bonus! The zipper made it so easy to put around the base of the tree. And after this, I can use it for our patio table. We also added summer art to the wall and a rainbow colored pillow (I got it on clearance in the patio section of a big box store!) to the chair to carry the theme throughout. I am totally in love with this summer tree … my daughter Katie said it looks better than our regular holiday tree. I was kinda hurt but then I realized she was right. The ornaments DID look better on this tree! With the upside-down tree, the ornaments have room to hang and swing downward. The ornaments look better because they are not hidden behind or pushed up by branches below them. I'm totally gonna use this tree again for Christmas! Plus, it's pre-lit so set up is super duper easy. 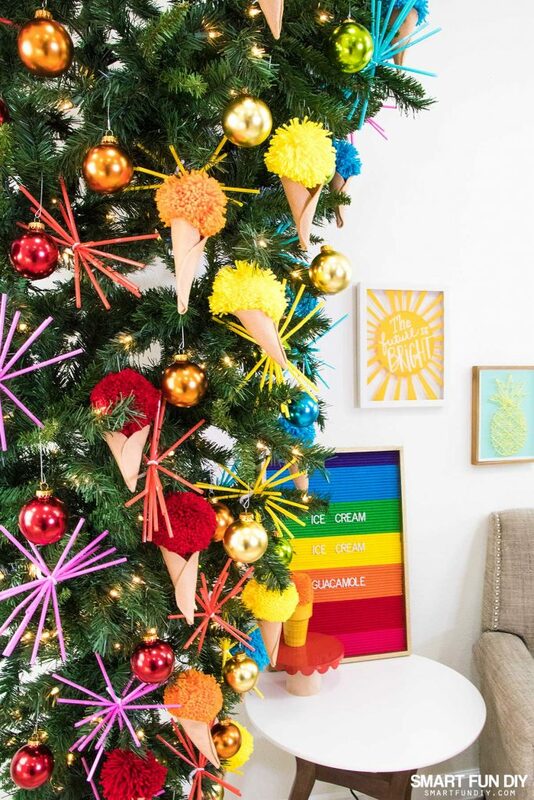 Want more Christmas in July inspiration? 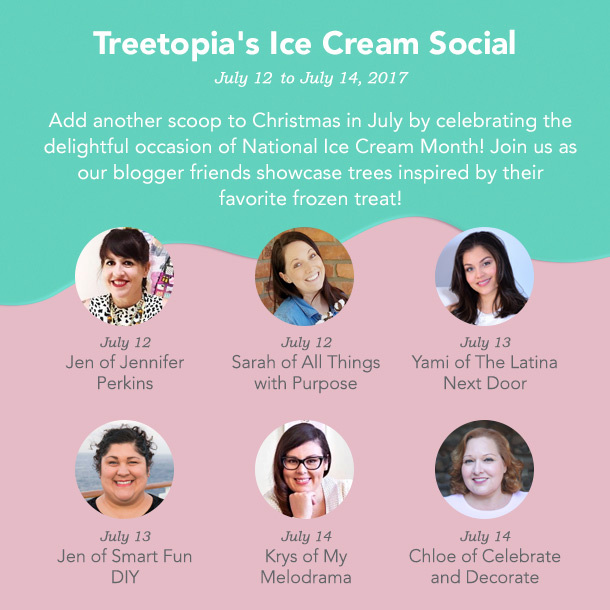 Visit these amazing bloggers and see how they created DIY ice cream themed Christmas trees for Christmas in July! Now, head on over to Treetopia's Facebook Page to enter the giveaway for a $100 Treetopia gift card! 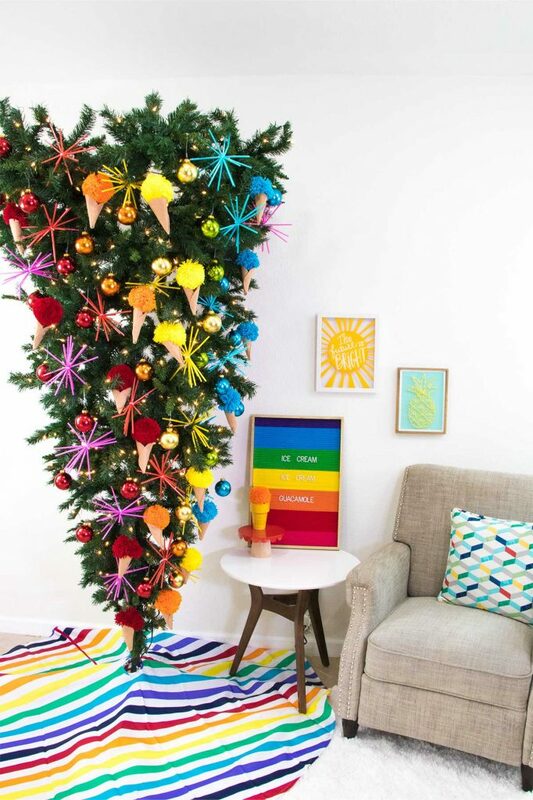 Have you ever decorated a tree for Christmas in July? I'd love to hear all about it … and if not, what's stopping you?